Fix: None of your e-mail accounts could send to this recipient. So I am a huge fan of these odd ball issues. When one of my users called me telling me they couldn’t send a “few” messages to people I told the helpdesk I was going to look into it myself. Now I have never seen that error before, and what really got my interest was there was no x.x.x error code. This lead me to think it was a local issue with the client. 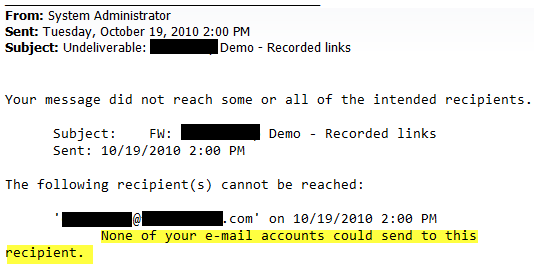 Some Google searching lead me to think it had to do with missing message connectors (like fax, etc..) but this user didn’t have any of that. Some times it really helps to just talk to the end user. After speaking to her we discovered this only happened when clicking a mailto: hyperlink from a forwarded email down in the thread. When I went back to my desk I noticed that my FROM: tags were not hyperlinked like the ones from my user. After comparing the differences I finally noticed that she had the SalesForce.com plug-in installed. 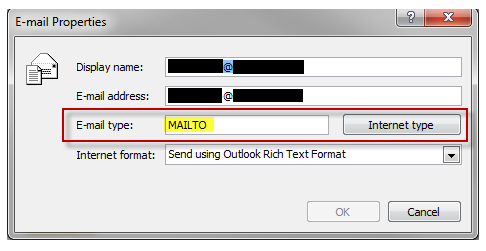 What it is doing is actually sending outlook a email type of “MAILTO” instead of SMTP. After pressing ALT+K you can double click the resolved address and see what the email type is. If its set to MAILTO it will not work. You can however press the internet type button and it will change it to SMTP (which will allow it to send). So there is no real solution right now, I am going to check with SF.com enterprise support but I have a feeling they wont do anything about it. After showing the end user what not to do and showing how to correct it she was happy enough with the solution. If you find the same problem or any other add-on causing this please let me know so I can add it to the list. UPDATE 2: Thanks to Tom, we now know MS is hopefully rolling out a patch for Outlook 2010 sometime this month (fingers crossed). UPDATE 3: I just saw there might be a fix for 2010 you can test out this hotfix from MS. If it works let me know in the comments: http://support.microsoft.com/kb/2475888/en-us or possibly http://support.microsoft.com/kb/2597052. Ive got a user with the exact same issue just discovered today. we dont have salesforce.com plug in. tried again in outlook safe mode without any add-ins and the problem continues. it might be an outlook thing, but can’t find a setting to tell outlook to not set it as mailto ?? I also have a customer with the same issue – i am thinking somthing has been installed which has messed up the default behaviour of mailto links. I have a customer with the same problem. The customer uses a terminal server (2003 server) with Office 2007. The problem only exist on this server, not on the other clients. It seems that the problem appeared for the first time not long after installing Windows and Office updates. We don’t use any plugins. Has someone a tip or solution? if you type the address out manually (dont allow auto fill to enter the address) does it still not work? dealing with this too – i think it may be an incorrect setting under options and then international options. my user had some weird choise in there, changed to western european (iso) . seems to be ok now. Use NK2 View and delete email address. I had the same issue. I had to format my computer and reloaded the backup of my outlook 2007 pst file. Since then, if I use my address book to send a message to one of my contacts then it will not go. I then have to type in the recipients email address again and it goes. What I therefore need is a formatting option to go through all my contact email addresses and somehow change the settings. Any thoughts please? We have the same issue. We are using the workaround to change the Email type from Mailto to SMTP. I noticed on another computer their is no “mailto: _@_” Just wondering if I can change the settings on incoming mail messages to not add the “mailto”, as then there would be no mailto link to click on in the first place. It would just show the email address without the mailto, which works just fine. Nice! This was exactly the problem we were seeing with one user. We haven’t determined where his few MAILTO addresses came from, but he knows how to fix the problem. It looks like once the address is switched to SMTP, the NK2 cache saves that type. Great post! Same issue with a user. Removed her gmail account, problem solved! Resolved the issue! Great find! Andrew thanks so much for posting! I have updated the post. @andrew. Thank you. This was driving me insane on how to fix it! the MS hotfix addresses the very problem. you can also use N2K viewer to remove problematic entry. I have same problem. But I use Office 2010 (Outlook 2010 and Word 2010). Is there any fix? a fix for 2010 is due in the December outlook update. So fingers crossed. Tom Awesome stuff, thanks for posting. Hopefully MS will get this out the door before end of year. Has this been fixed in Outlook 2010? We are still having this problem. Please, if someone can test it out and report back. Thank you ll so much for this! I installed the hot fix Microsoft supplied at this link, http://support.microsoft.com/kb/2597052. It did not work for me. I am running Outlook 2010 SP1 on Windows 7 Pro SP1. Did it work for anybody else? Over the last couple of weeks, I have seen the “None of your e-mail accounts could send to this recipient” error for various reasons. Sometimes the users were clicking the “mailto:” link but most of the time, they receive this error even while manually typing in the e-mail address. For this instance of the issue, I have successfully resolve it by reinstalling outlook. Once I uninstalled outlook, I went into the appdata folder and renamed the outlook folders to .old. I am not sure why this issue is happening though. I am trying to push the 2597052 hotfix via SCCM. Even after an hour of it “running” is has not finished. I assume this is because I am trying to run this suppressed so that the users do not see it, but there is a “prompt” to accept some sort of EULA. Is there a switch or a way around this? This is crucial since we have a lot of users with the associate Outlook 2010 problem. Please help! Nevermind, I found the answer with a /quiet /noreboot command works. Thanks though. this fix the problem for me….. This worked for me… file…options…uncheck Automatic name checking. This site was a great help. Rajesh – your solutions seems to work PERFECT & it was VERY EASY! Thanks! Thank you! Worked first time! But it’s not all emails that it does it. I’m wondering if text or richtext are ok and it’s just html?? Will do more testing soon. in Outlook 2010, if I hit Alt+K to resolve an address, I can’t then double click to get Email Properties – I just get a Lync contact card. This fix of getting rid of the cached address which had mailto: in it and manuallly typing the address did work though – so the problem is solved as far as the user is concerned (he wasn’t clicking the mailto: hyperlink, but he was copying and pasting, which essentially copied the MAILTO: format. anyone know how i view E-mail Properties in Outlook 2010? Just seen this site so I might be a little delayed here but for reference to others who need to kow how to do this. Nice one Eric, worked like a charm. is there a solution (hotfix) for Office 2013 with similar problem?